Signs of a successful integration continue in year two as a merged company. NICE and NICE inContact last week held their annual user/analyst/partner event, Interactions, in Orlando, Fla. It was the second annual event since NICE acquired inContact in late 2016, and signs of a successful integration were evident in strategic alignment, product updates, and, most importantly, enterprise sales success that exceeded expectations. At its May 2017 event, NICE CEO Barak Eilam introduced the company's four strategic pillars: cloud, omnichannel, analytics, and artificial intelligence. A year later, I found it refreshing to hear Eilam begin his presentation to industry analysts discussing these same four pillars, saying the company evaluates any major initiative on how it will contribute to one of these pillars. 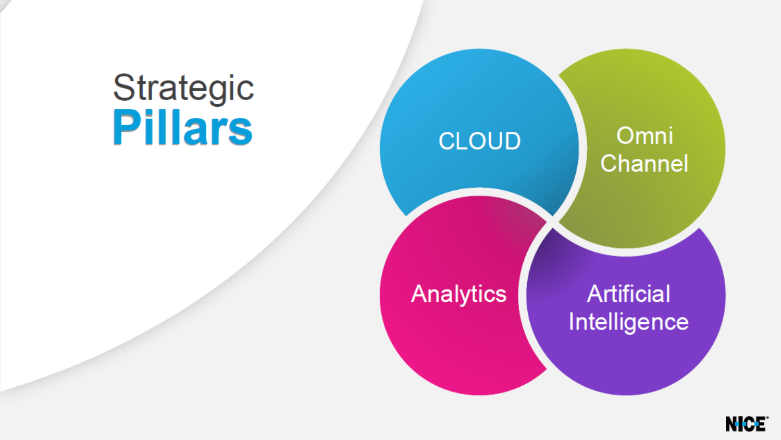 NICE's April announcement that it will acquire cloud-based analytics company Mattersight, which reinforces the cloud, analytics, and AI pillars -- and arguably omnichannel as well -- is a solid example of the company's strategic discipline. Eilam discussed the acquisition, highlighting that Mattersight will bring marquee customers (including Comcast, The Home Depot, CVS, and UnitedHealth Group), analytics, and AI domain expertise to NICE. Announced in July 2017, CXone is NICE inContact's flagship solution. In the photo, NICE inContact CEO Paul Jarman is describing the latest CXone update, specifically in analytics and workforce optimization. The Pro versions of analytics and workforce optimization refer to new native, microservices-based CXone applications. NICE inContact delivers these applications using the same common user interfaces, administrative tools, and data model as CXone Omnichannel Routing. The Enterprise applications are cloud-delivered versions of applications that many large enterprises are already familiar with and using today from Nexidia (Analytics Enterprise) and NICE (WFO Enterprise). NICE inContact has integrated these applications with the CXone platform. During his presentation, Eilam addressed an analyst's question about how successful NICE has been in meeting its goals for the inContact acquisition, particularly in regard to taking NICE inContact solutions up-market further into the enterprise and NICE solutions down-market to smaller ones. A year ago, Eilam admitted, "We didn't think customers with five to eight thousand seats would be moving to cloud for two years. Instead, we see them strongly adopting." In his keynote address, Jarman reported that NICE had 550+ new cloud customers in 2017, and, under nondisclosure, he shared the highlights of several multi-thousand agent seat wins. This is higher than the new logo number of 450+ the company won in 2016, an uptick Jarman attributed to companies deciding to do complete digital transformations rather than small proofs of concept. One year ago, for example, a Fortune 100 company might have moved 300 seats in a small division to the cloud as a pilot. In contrast, NICE inContact today is working with a chief customer officer whose goal is to move Net Promoter Score (NPS) 10 points. According to Jarman, the company believes its current system is too disparate and disjointed to have a unified NPS program. This company wants to know how NICE inContact can help it achieve its NPS target, using the complete CXone platform. The company estimates that each point of NPS is worth millions of dollars to it. "This is a massive strategic project. We're moving thousands of seats. It's a complete transition," said Jarman, adding that seeing more companies ready and willing to do complete transformations then NICE inContact thought would be is exciting -- and surprising. On the globalization front, while NICE certainly has a substantial footprint globally, it has needed to make "significant investments in a voice presence in each country" in which the company wants to offer CXone service, Eilam said. That work has meant perhaps slower progress on the globalization front, but it is certainly an area to watch going forward. While the North American market has been showing significant cloud contact center growth over the past two to three years, the rest of the world has seen slower adoption. It will be interesting to watch the European, Asian, and Latin American markets unfold over the next few years, with not just NICE inContact but many of the contact center players setting their sights on international markets to expand growth.